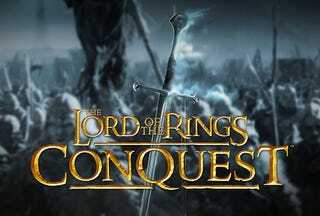 Pandemic Studios took the winning formula from the Star Wars: Battlefront series and applied it to the Lord of the Rings fantasy universe to create Lord of the Rings: Conquest. It sounds like such a sure thing, doesn't it? Epic fantasy battles recreating moments from the beloved fantasy books and movies. All EA and Pandemic had to do was make sure it was at least an average title and they would have captured a significant portion of the millions of Tolkien fans worldwide. As easy as dropping a ring into a volcano. Did they succeed in their quest, or will the hordes of gaming critics bring them to their knees? There's a commonly held belief among gamers that when a publisher releases a bad game, they aren't aware of its poor quality. That it must just be a mistake in that the company simply has a different idea as to what exactly constitutes an enjoyable experience than we do. Sadly, the reasons for the appearance of tripe like Conquest in its raw, unpolished, buggy, mirthless form are those of business. Of deadlining to fit a specific window, to be included in the financial year or to pay the way of an ongoing license agreement that the publisher is unwilling to relinquish. We can't be sure that this is the case with Conquest, but call it an educated guess. A capture-the-rally-points and do-other-lovely-chores snoozer that's extremely reminiscent of the Star Wars: Battlefront series, Lord of the Rings: Conquest is full of frustrating moments like this. Though you're given a generous number of lives with which to complete each campaign mission, many scenarios cause missions to end instantly. The most common one is being killed when you're protecting a key location: the time it takes to choose your character and respawn means that the positions are often overrun before you have a chance to fight back. ...there is also a lightness to the combat that's unsatisfying. Through a combination of sound design and animation, strikes don't connect with the weight and power one expects of this universe. Jump or fall from a 25-foot wall and your character won't so much as buckle at the knee, giving the game a weightless, videogamey feel that's at odds with the supposed grand scale and gravity of the universe. Most of the character models look like reasonable gaming equivalents to their cinematic counterparts, while the larger beasties like Balrogs and Trolls are relatively impressive in their movement and appearance. Other animations fare less well: orc swordsmen have a peculiar way of waddling into battle, while running one horse into another can result in a bizarre glitch that sees your nag sliding about on its nose. Pathfinding can also be an issue in levels that feature narrow ledges: there are quite a few chuckles to be had from watching suicidal elves hurling themselves off cliffs in the Mines of Moria. The Lord of the Rings: Conquest is a straightforward affair with very little that will pleasantly surprise anyone who played Star Wars: Battlefront. Its combat and general mission structure is by-the-books and the lack of expandability and feeling of redundancy are felt instantly. Withstanding all of that, Conquest still somehow manages to earn merit on its expert use of The Lord of the Rings license. The environments feel like they're straight from the silver screen and Howard Shore's multiple orchestral pieces are great to fight alongside. If you're looking for another take on the deliciously addictive fun of Star Wars: Battlefront, but with a fantasy setting, you may want to look somewhere else. Too much of this game feels phoned in to be able to recommend it. Well that was relatively painful.